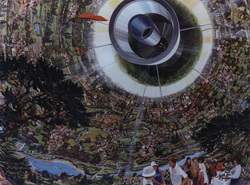 When the first space habitats are constructed, the furnishing of the interior will start. Trees need to be planted and many buildings have to be built. Houses, offices, hospitals, schools and so on have to be constructed. It might take a decade or more before all these building will be finished. The construction of buildings with a public function will have a priority. Hence we should consider temporary shelters till the time permanent establishments have been arranged. One idea could be to house the first settlers in “army” tents. Though they could be established quickly and at low costs, their appearance will be too provisional. Further tents are also quite vulnerable. A better option, in our opinion, is the use of quonset huts, prefabricated structures of galvanized steel designed to establish temporary shelters in short time. 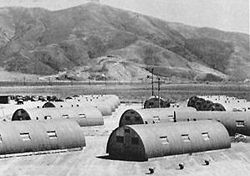 Quonset huts were developed during the second world war by the US military. After the war they also proved to be useful for civilian purposes. Quonset huts are quite durable, and could be used for decades. Therefore the are preferable to tents. Because they are intended for temporary use, they will dismantled when permanent buildings will be available. Thereafter the huts could be reused at other locations.